Messi will serve the first game of the suspension on Tuesday afternoon when Argentina visits Bolivia in another World Cup qualifier. The team’s captain and all-time leading goal scorer also will sit out Argentina’s next three World Cup qualifiers in August, September and October, returning for the team’s final qualifying match against Ecuador on Oct. 10. In 2018 World Cup qualifiers played without Messi, Argentina has amassed just seven of a possible 21 points. 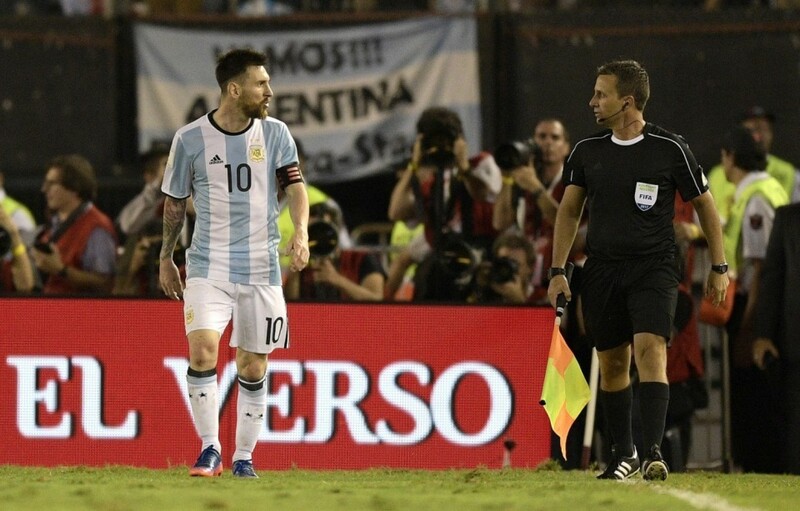 According to ESPNFC, Messi shouted profane insults at assistant referee Emerson Carvalho after he was whistled for a foul late in Thursday’s match against Chile. He then refused to shake hands with Carvalho after the game. The incident was not initially reported by the main referee on the official match report. “I did not hear any offensive language from Messi or anyone else towards myself. … If I had heard any offensive word, I would have acted in according the rules of the game,” the head referee, Brazilian Sandro Ricci, said in documents from the FIFA inquiry that were obtained by the Argentine newspaper Ole. Nevertheless, it was judged a red-card offense. An Argentine soccer official said the team will appeal the ruling — saying there is a precedent that suggests the penalty could be reduced — and described Messi as “beaten and sad” over the news. The news was greeted with surprise from some unusual corners of the world, including Bolivia, where President Evo Morales took the side of the Argentina, against whom his national team was set to play. Argentina, which reached the final of the 2014 World Cup in Brazil, sits third in the South American World Cup qualifying standings, just one point ahead of fourth-place Colombia and two clear of Ecuador and Chile. The top four teams in the final table will qualify for the 2018 World Cup in Russia, with the fifth-place team taking on the champion from Oceania in a two-leg playoff to decide another bid in November. FIFA have banned Lionel Messi for four international matches after finding the player guilty of verbally abusing an assistant referee. The world governing body issued a statement on its official website confirming its decision after the incident, which occurred as Messi featured against Chile for his country. Lionel Messi has been found guilty of violating art. 57 of the FDC for having directed insulting words at an assistant referee. The Barcelona superstar also received a fine of CHF 10,000, with the ban starting Tuesday as Argentina face Bolivia in World Cup qualification in La Paz. The game is vital for the South American giants as they hold on to their qualification berth by a narrow margin in the standings. Messi will miss the majority of the remaining qualification fixtures, and his absence could have severe ramifications on Argentina's prospects of featuring at Russia 2018. Argentina lost 2-0 to Bolivia in World Cup qualifying, five and a half hours after captain Lionel Messi was given a four-match ban for abusing an official. The result left Argentina fourth in their South America group. With four games remaining of World Cup qualifying, Colombia climbed above Argentina and Uruguay into second as they beat Ecuador 2-0 with goals from James Rodriguez and Juan Cuadrado. And Argentina could drop out of the top four automatic qualifying spots for Russia 2018 if Chile beat Venezuela on Tuesday night, with Uruguay also in action against Peru and leaders Brazil facing Paraguay. The team that finishes fifth advances to an inter-confederation play-off featuring one side each from Asia, Concacaf and Oceania. Messi, meanwhile, will miss games against Brazil, Uruguay and Venezuela later this year. 0 Response to "FIFA suspends Lionel Messi for four World Cup qualifiers for insulting a referee"